The output gap is a key concept in mainstream economic analysis of inflation. Although I am not happy with the details of the standard analysis of what determines inflation, I use a weaker version of the standard output gap in my thinking. I refer to this version as the generalised output gap (GOG). In this article, I give a simplified summary of economic theories of inflation and how various conceptions of the output gap relate to this. Since a academic history of theory of inflation would turn into a rather large book, I am going to quickly outline basic archetypes of such theories, without directly associating these views with historical schools of thought. Please keep in mind that most economists had more nuanced views on inflation than these archetypes. 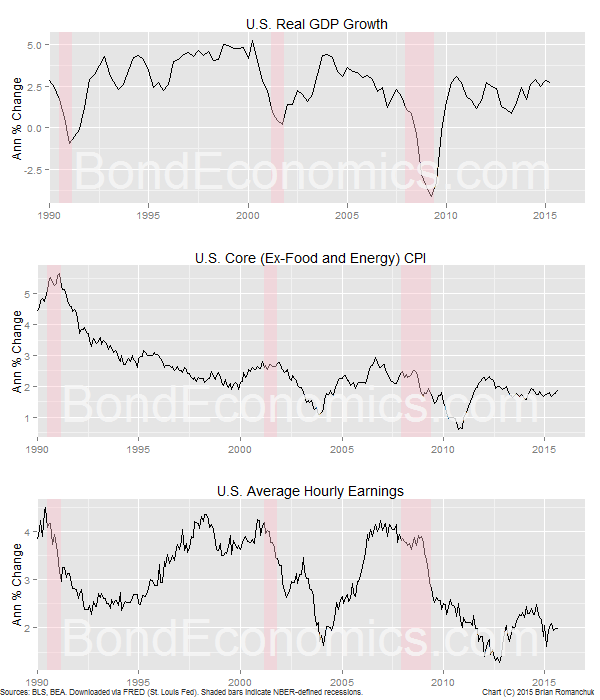 What I am interested in are theories that explain the level of aggregate inflation (for example, "why is the CPI rising at an annual rate of 1% rather than 3%"? ), and not theories about the details of why prices rise. Within the mainstream, I would divide theories that explain inflation into five groups. Prices determined at the margin. Prices are determined by the intersection of supply and demand curves; insert comments about marginal productivity here. Since supply and demand curves are not directly observed, this "theory" does not offer much in the way of insight, and I will not discuss it further here. The theories that follow are also based on the belief that pricing is determined at the margin, but the shifts in supply and demand can be associated with other measurable variables. Crude Quantity Theory of Money. This theory says that if you increase the quantity of "money" in the economy by 10%, and hold all else equal, the price level will rise by 10%. I will merely assert here that this crude theory obviously fails empirically, but an interested reader can read an earlier primer for more of my thoughts on this matter. It should be noted that many DSGE models embed a crude quantity theory of money in the mathematical core of the models, but the implications of this are typically ignored in practice (other than by the people who thought Quantitative Easing was "printing money" and would lead to inflation). Central Bank Fiat. Expectations about inflation are an important component of DSGE modelling of inflation. This can be taken to an extreme, and one can argue that the central bank just announces a target for inflation, and it will magically go there through the power of expectations management. Other than a few academic eccentrics, this theory is not widely credited, even though it is embedded within DSGE model assumptions. Since inflation targets (where they exist) have been fixed quantities, central bank-driven expectations cannot tell us a lot about the variations of inflation around the target. Inflation is demand-driven. Inflation rates are driven by the state of aggregate demand (as well as expectations). This ends up being associated with the output gap (or NAIRU), discussed below. Since I consider myself some form of post-Keynesian, I would love to explain the corresponding post-Keynesian theories of inflation. Unfortunately, the best summary I can come up with is: "it's complicated." It is discussed in Chapter 8 of Marc Lavoie's Post-Keynesian Economics: New Foundations (review), and he provides the following quotations (page 542). From Weintraub, "economy is primarily a money-wage system," that is, a key factor in monetary economies are the nominal level of worker's wages. Moreover, Robinson argued that "in our model, as in reality, the level of the money-wage rate obtaining at any particular moment is an historical accident." Lavoie's text also includes an extended discussion of external effects (foreign trade) on the price level. Obviously, internationally traded commodity prices are largely not determined by solely domestic factors (certainly for smaller countries like Canada). If I want to model headline CPI (which includes gasoline prices), I am perfectly happy to leave the price of oil as a driving factor that is external to the model; the model forecast is conditional upon your oil price forecast, which presumably depends upon what is happening in the global economy. 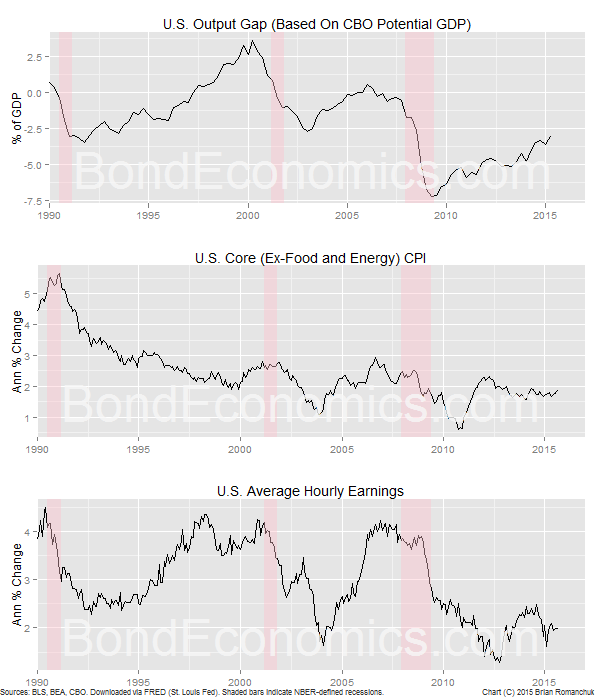 Core (ex-food and energy) and wage inflation is much less dependent upon traded good and commodity prices (at least in most developed countries), and that is what we are hoping to model. Many post-Keynesians will object to my minimisation of the effect of the external sector on the domestic price level. I would just respond that the importance of the currency is conditional upon a country's economic institutions. Countries that are in hyperinflation, or merely have sustained high inflation, often end up with domestic prices for many goods being effectively indexed to foreign prices. This creates a 1:1 pass-through from the value of the currency to the price of those indexed goods. In such a case, it would be obviously crazy to ignore the value of the currency. But this is not the usual situation for developed countries. For example, I am now holding a book manufactured in the United States where the printed list price is $29.99 USD, and $35.99 CAD. This is an embedded exchange rate that values the Canadian dollar at less than parity, whereas when I bought the book the Canadian dollar was worth more than the U.S. dollar. The book was not priced in Canada as a translated American price, rather it is priced relative to other books in Canada, and those prices do not vary based on the exchange rate. There are presumably limitations; if the Canadian dollar collapsed to CAD$3 = USD$1, I imagine that list prices would be adjusted. But we do not tend to see such hefty devaluations outside of currency peg environments. In summary, the mechanisms explaining inflation rates are complicated. But I would argue that there is a fairly widespread belief that "excess demand" conditions are somehow related to the level of inflation, although this could be disputed by minorities within the mainstream and non-orthodox schools of economic thought. The chart above shows that stronger growth is generally associated with stronger inflation, and weaker growth (particularly recessions) are associated with weaker inflation (at least for the "modern" U.S. economy). In particular, wage and CPI inflation fell considerably after the three recessions during the period depicted. The experience in other developed countries over this period was similar, although some countries had some exceptional circumstances (such as Iceland after the financial crisis). The output gap is an attempt to create a more formal version of this observation about growth and inflation. Many post-Keynesians are not fans of the "output gap." For example, I was recently given a reference in the comments to this article by Paul Ormerod, "The so-called ‘output gap’: another piece of economic mumbo-jumbo." I largely agree with his sentiments within the article, yet at the same time, I will still refer to the "output gap" constructively. Upon reflection, I realise this is because there are a number of definitions for the "output gap," and people switch amongst them without specifying which one they mean. Given this imprecision, I will now give a series of definitions for different output gap concepts, which are distinguished by their acronyms. It should be underlined that these are my definitions; if you go elsewhere for a definition of the output gap, it will only roughly correspond to one of these definitions, or a hybrid of them. Strict Output Gap (SOG). We define a concept called "potential GDP," and it is determined by a production function. The SOP is a time series which is actual (real) GDP less potential GDP. (Reminder: real GDP is Gross Domestic Product adjusted for inflation.) This production function has inputs which consist of the size of the labour force, and physical capital, and is of some simple form like the Cobb-Douglas production function. Once we have estimated the parameters of the production function, we can predict the evolution of potential GDP based on changes in the labour force and capital. If we are worried about falsifiability (which we should be), this definition is eminently falsifiable, as we have a strong definition of potential GDP which is based on directly measured inputs. (It may be hard to estimate them in real time, but we can at least test the historical fit.) There is a wiggle factor in the form of total factor productivity, but as long as its evolution is plausible, we can test the theory. Really Stupid Output Gap (RSOG). Calculate potential GDP using the Hodrick-Prescott filter (as discussed here). Although this method was done historically, it was abandoned by most economists a long time ago. It can be falsified, which has already been done (repeatedly). Generalised Output Gap (GOG). Once we fix an economic model, the GOG is a state variable that has the property that inflation will move in the same direction as the GOG. That is, if the GOG increases, inflation would be higher if we hold all else equal, and vice versa if the GOG decreases. (If a variable has the opposite effect, we just multiply it by -1 to get a GOG.) There is no assumption that the GOG is directly measurable, nor is there a means to directly construct it from measured economic variables. Additionally, the GOG is model dependent -- the estimated GOG would vary depending upon what model we choose. Slippery Middle Output Gap (SMOG). This is a concept that lies between the SOG and the GOG. In it, we have a state variable, which is denoted "potential GDP," and the SMOG is the difference between potential GDP and actual (real) GDP. The potential GDP is an estimate that is model dependent, similar to the GOG. I would argue that the SMOG is the standard mainstream definition of the output gap used in practice, and "market economists" will jump between it and the GOG definition. The chart above shows an estimate of the output gap, based on the Congressional Budget Office's (CBO) estimate of potential GDP. I believe that the CBO's estimate of the output gap would qualify as being a SOG version, at least based on reading this document. Deciding how useful this SOG is for predicting inflation is left as an exercise to the reader, but the chart does suggest at least some relationship between the variables. The reason why I am sympathetic to the generic idea of the "output gap" is that I accept the concept of the GOG, and there is nothing to distinguish the GOG from a SMOG. And since the bulk of the profession implicitly accepts the SMOG, my views are practically not that different from the consensus. Since the GOG is not the "gap" between real and potential GDP, a linguist might argue that it is not really an "output gap." However, since I find the concept indistinguishable from a SMOG, it is a lot easier to explain my thinking if I just use the pre-existing phrasing. One could make the sophisticated argument that there is a difference between a SMOG and a GOG. In a SMOG, the output gap is the difference between a directly measured variable (real GDP) and a estimated variable, whereas in a GOG, the output gap is just a single estimated variable. If we can shock the level of GDP and hold all else equal, it will have an effect on inflation in a SMOG model (the effect depending on the model), whereas this shock will not have an effect in a GOG model. However, this just illustrates the point that a sufficiently sophisticated argument is indistinguishable from stupidity. We cannot directly shock GDP, so we cannot observe this alleged effect. Moreover, any reasonable estimate of potential GDP shows that it moves slowly, as does the level of real GDP. Therefore, the deviation of these two variables (the SMOG) moves slowly, and so any plausible movement in real GDP will not cause any statistically significant changes in the model's inflation prediction over short time intervals. Since we cannot theoretically distinguish a SMOG or a GOG, my analysis ends up sounding similar to the mainstream. The differences revolve around acceptable estimation techniques. I already discussed the possibility of falsifying the SOG and RSOG variants of the output gap. The issue with the GOG (and by implication, SMOG) is that falsifiability is more of a concern. The first thing to note is that the GOG is model-dependent. We cannot say that the GOG itself is falsifiable, rather we need to look at the entire model. That is, does the model make any useful predictions about the future dynamics of the economy? The SMOG is somewhat more falsifiable, as it is attempting to pin down "potential GDP," which is directly related to a measured variable, but the estimation itself depends upon assumed model dynamics. Secondly, the GOG should be related to a wider variety of directly measured capacity utilisation indicators (such as factory utilisation and the unemployment rate). In a simplified model economy, the GOG should end up looking very much like a SOG. The exact relationship may shift over time, but we should be able to see at least some linkages. Finally, it appears to be a mistake to think of the GOG as always being a single variable. For example, there can be considerable regional differences within an economy; overheating in the oil-driven Alberta economy has only a limited effect on those of us in Eastern Canada. Furthermore, there can be considerable divergences within different segments of the labour market. Booming salaries for debt traders has not translated into higher wages for those working in the fast food industry. Once we start dis-aggregating our economic models, we will likely end up with dis-aggregated GOGs. This article is largely theoretical. Although I enjoy theory for the sake of theory, the distinction between the different versions of the output gap are of interest for the current situation in the United States. From the perspective of the GOG, I would look at the behaviour of inflation series and argue that the GOG is still negative. Although it is not necessarily directly related to particular economic variables such as GDP, the fact that growth has been relatively steady along with inflation over the past few years, is a sign that the GOG is not closing. Correspondingly, I see no reason to tighten fiscal or monetary policy (whatever that means) in order to defeat inflationary pressures. Conversely, believers in a stricter (SOG) version of the output gap generally have had a harder time explaining the U.S. economy's recent behaviour. According to some SOG estimates of the output gap (or related concepts such as NAIRU), the U.S. should have closed its output gap, and so monetary policy should have been tightened already. However, a SMOG version of the output gap should have adapted to the observed lack of inflation, and so some SMOG models will end up with a doveish diagnosis similar to mine. One suspects that many economists ended up picking models based upon their pre-existing biases. There are a number of definitions one could use for the "output gap." If we are willing to accept the loosely-defined concept of a generalised output gap, it provides a way of thinking about inflation dynamics, but we need to keep in mind that it does not necessarily correspond to traditional estimates of the concept. And in practice, many of the estimates of the output gap produced by "modern" statistical techniques (e.g., Kalman filtering) are just disguised generalised output gaps. * An overly simplified version of the Chartalism embedded in Modern Monetary Theory (MMT) would end up being very similar to the Fiscal Theory of the Price Level (FTPL). That is, an increase in government spending will mechanically raise the rate of inflation. This would be a weakness of MMT, if this interpretation holds true. However, MMT is a school of thought within a broader post-Keynesianism, and it inherits the overly complex post-Keynesian views of inflation as well. As a result, although looser fiscal policy is presumably associated with higher inflation, the linkage is not as simplistic as suggested by the FTPL. ** The 1970s experience has be explained using output gap analysis as being the result of bad real-time estimation of the output gap. That is, policy was in fact far looser than was thought at the time, and so there was an ongoing policy error. My feeling is that the situation was more complicated than that, but I have not studied that period in enough detail to have strong opinions on the matter. Michael Pettis recently posted an article on MMT and whether "thin air money" created additional demand that might interest you (he thinks it all depends on the output gap). The article looks interesting, but it's covering ground that I would rather avoid. He is attributing things to MMT that I do not think MMT says (although he says he is unsure what the MMT line is). For those who have not read the article, he refers to the possibility that the government can monetize any debt/deficit. I think the MMT academics need to respond. My feeling is that there is not really a disagreement, just differences in terminology. The MMT line is just a revival of Functional Finance, which says that the government can always meet nominal obligations, at the cost of potential inflation. It's just a question of how that observation is framed. Any views on N.Rowe's piece here Brian? It's hard to argue against the idea that if we assume that monetary policy cancels it out, fiscal policy is ineffective. The problem is that is just an assumption of the New Keynesian models, and they have structured the analysis so that the claim is unfalsifiable. On a less theoretical note, He refers to Canada in the 1990s. In that case, the weak dollar did offset fiscal tightening. I agree, but whether the weak currency is "monetary policy" is a reasonable debate. Nick Rowe uses an extremely wide definition of what monetary policy is; outside of currency peg arrangements, I would view "monetary policy" to be "interest rate policy". Since we using different definitions, we end up sounding different. Pretty sure the CBO (like the BEA, ECB, etc.) uses a a RSOG (in your terms) disguised as a SOG. That is,m there is a model, but because some of the components (total factor productivity, the NAIRU) are calculated as trends, the series as a whole behaves like a trend. The model part is just window dressing. An increase in the measured capital stock, say, leads to a fall in the imputed TFP and no change in the estimate of potential output. Unfortunately I don't have time to back up this claim properly right now. Yeah just rereading the CBO thing it's clear that it's just an obfuscated RSOG. Instead of just using a filtered GDP series, you use filtered series for K and L imputed TFP and then assign the parameter values you need to get it to match the filtered GDP series. This will get you the exact same result as if you'd just used GDP in the first place. The one advantage, I suppose, is that it lets you talk about hypothetical scenarios where K and L follow different paths. But I'm pretty sure the estimate for potential output is unaffected by the use of the model. I would classify it as a SOG (RSOG is using the HP filter, which is a pet peeve of mine).